It wasn't too long along that we saw a new Subway location pop-up on Grand Avenue near the new Menards store (well, new then). That location which replaced the location in the Spirit Valley Center will soon be joined a mere 1.28 miles (yes, we Mapquested it) down the road by another new, freestanding Subway location. The franchise opening the location will be Mike Jones, the man responsible for basically every Subway location you see in the area. Just how many Subways are there in the Twin Ports? Well, if we have completed our counting correctly, this will be location number... drum roll please... SIXTEEN. We really must be a sub loving community! 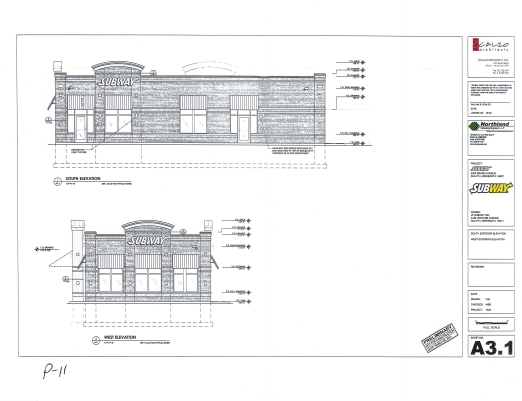 The new, 2,400 square foot Subway location, will be open this summer at 4402 Grand Avenue and will replace a building that is currently on site, which will be razed for the new construction. If you can't figure out where exactly this is... it's basically in the parking lot of ACME Tools and at the intersection where you now see the large parking lot leading to Denfeld High School. Designed by Scalzo Architects, the lcoation at 4402 Grand Avenue will feature a design similar to that found down the road at the Subway location on 1820 Grand Avenue, the location that opened a few years ago at 4707 Mall Dr, and also the newest location that opened on Tower Avenue in Superior last year. A letter from Scalzo Architects notes how important the redevelopment of this site is, stating that it "will result in the removal of older underutilized buildings" along with re-using a site that already has contaminated soil conditions. The letter also notes how the new location and its construction will allow a "reduction in the existing impervious surface" meaning, less concrete and tarmac parking lots. In fact, two parcels will actually be redeveloped in order to provide a total of 27 parking spaces, meaning more green space as parking will be spread over a larger area. To be honest, we're excited for this one! We've driven by the site countless time always wondering when it would be redeveloped. We knew a while ago that when ACME Tools built their new store that they were going to be part of a large development on the block, but we were always wondering when the development would continue. Subway is a really good "draw" tenant for sites, plus it makes sense that they would want to locate by the new Erbert and Gerbert's store that opened last year on the other side of the block. Eventually the plan is for ENTIRE block to be redeveloped as a new commercial "center". We saw this begin this past decade with ACME Tools, then the CVS Pharmacy, Erbert and Gerbert's, and Sport Clips building last year, and now with the planned Subway and also the planned Whole Foods Coop location on site. Things are looking great for this block!